The Community Arts Center offers a magical historic setting in a convenient location. Located just off 476 and minutes from the airport, it’s easily accessible for guests from out of town as well as all over Philadelphia, Delaware County and the Main Line. 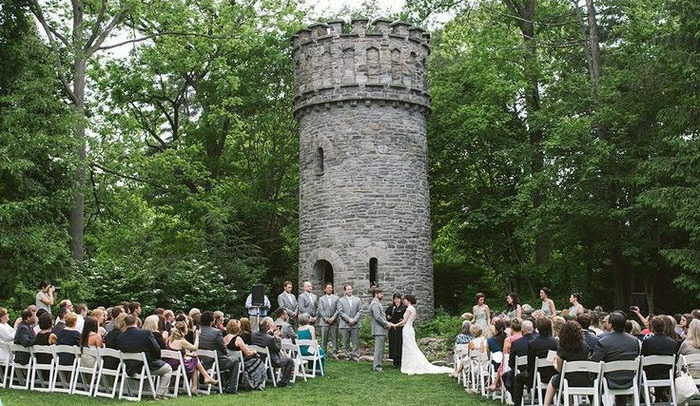 The spacious contemporary Duke Art Gallery, 19th century ballroom, castle-like water tower, and outdoor gardens provide abundant and varied spaces to make your event unique. Space is available for events Friday after 3:00 pm, Saturday after 12:00 noon and Sunday all day. There are limited opportunities for rentals during the week. If you are planning a small event where catering is not necessary, or if you are interested in using our space to present an arts event or performance please contact the CAC office at 610.566.1713 to inquire about availability.